In addition, we are enclosing our Invoice No. 2 for this phase of the work. Building Allowances (Itemize) Special Hdw. Title: Restoration of the DeMesa-Sanchez House, St. Augustine, Fla.
Project Name and Location: Restoration of DeMesa-Sanchez House. St. George Street. 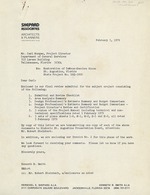 A/E NAM: Shenard Associates. Architects & Plafnners. Tnc. Appr. by HSAPB r g.
SHEPARD ASSOCIATES ARCHITECTS & PLANNERS, ING.